The tour begins in Cuiaba. International flights to Sao Paulo are typically overnight, arriving in early morning. Several flights from Sao Paulo to Cuiaba are scheduled each day. We recommend the 2:55pm flight on Gol Airlines to allow for flight delays on the international flight. Tour begins in Cuiaba. Night at Hotal Fazenda Mato Grosso in Cuiaba. Depart early for the 1½ hour drive to the arid canyon lands of Chapado dos Guimaraes. Upon arrival bird the arid cerrado (savanna) around the canyon rim. Notable birds likely there include White-eared Puffbird, Chapada Flycatcher, Curl-crested Jay, White-banded Tanager, White-rumped Tanager, Coal-crested Finch, and Black-throated Saltator. Also try for the difficult but possible Collared Crescentchest. The lovely Horned Sungem may be present if suitable plants are flowering. As it becomes hotter, bird the trail leading down the canyon and into gallery forest. Possibilities there are quite different and include Black-fronted Nunbird, Planalto Slaty-Antshrike, Band-tailed Manakin, Moustached Wren, and Saffron-billed Sparrow. During the day soaring birds such as King Vulture, Gray-headed Kite, Ornate Hawk-Eagle, Black-and-white Hawk-Eagle, and White Hawk. A late afternoon visit to the cliffs above the waterfall are likely to reveal Blue-winged Macaw and Red-and-green Macaw. Night at Pousada do Parque. Early morning birding around lodge. Some nice forest trails on the lodge ground are habitat for Brown Jacamar, Large-billed Antwren, Chapada Flycatcher, and Coal-crested Finch. Transfer to Cuiaba for afternoon flight to Alta Floresta. En route stop as time permits in a palm grove to look for Point-tailed Palmcreeper. After arrival in Alta Floresta, boat transfer to Cristolino Lodge in southern Amazon basin. Birding from the boat on the way in is a first opportunity for birds such as the very uncommon and unobtrusive Zigzag Heron as well as Green Ibis, Green Kingfisher, and the like. Night at Cristolino Jungle Lodge. Four full days in the southern Amazon along the Rio Cristolino and its tributaries will be spent walking trails around the lodge and birding riverine habitats by boat. The superlatives about the Rio Cristolino drainage are never ending and never over-stated. The birding is simply beyond superb. Birding by boat is easy and relaxing. Possibilities along shorelines in varzea (seasonally flooded) forest include Red-throated Piping-Guan, Razor-billed Curassow, Bare-faced Curassow, Bronzy Jacamar, Glossy Antshrike, Bare-eyed Antbird, Black-spotted Bare-eye, White-chinned Woodcreeper, Amazonian Umbrellabird, Flame-crowned Manakin, and mammals such as Giant Otter and various monkeys. 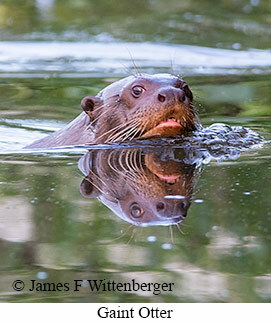 The Giant Otters are mostly seen farther up river in an area where huge Teak trees abound. Birding trails through terra firma (never flooded) forest near the lodge is more challenging but can be very rewarding. Most trails are flat and level though one steep trail up to rocky outcrops referred to as "serra" habitat is worth doing. Notable among the many possible species are Amazonian Pygmy-Owl, Rufous-necked Puffbird, Rufous-capped Nunlet, Red-necked Woodpecker, White-eyed Antwren, Rufous-winged Antwren, Para Foliage-gleaner, Zimmer's Tody-Tyrant, Cinnamon-crested Spadebill, and White-crested Spadebill. 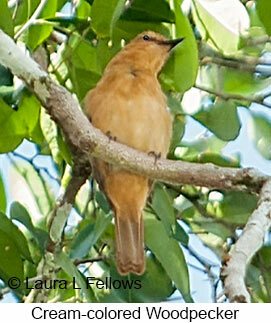 Less likely are species such as Dark-winged Trumpeter and Cryptic Forest-Falcon. Some trails go through dense stands of bamboo where bamboo specialists such as Amazonian Antshrike, Striated Antbird, Manu Antbird, Dusky-cheeked Foliage-gleaner, Large-headed Flatbill, Dusky-tailed Flatbill, and Rose-breasted Chat can be found. 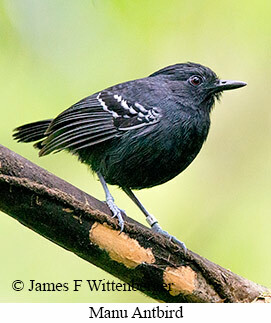 Hiking the steeper trail up to the rocky outcrops may produce Brown-banded Puffbird, Spotted Puffbird, Natterer's Slaty-Antshrike, White-fringed Antwren, Rufous Casiornis, Brown-crested Flycatcher, and White-browed Purpletuft. 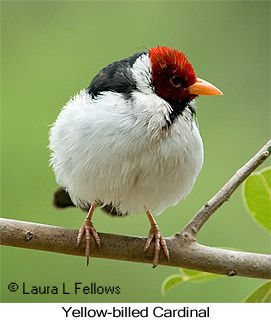 The rare Fiery-tailed Awlbill is also likely to be seen in this habitat. Some time will be spent atop the the two 160-foot canopy towers for better views of canopy specialists. Possibilities in the canopy include Black-girdled Barbet, Lettered Aracari, Curl-crested Aracari, Red-necked Aracari, Gould's Toucanet, Ringed Woodpecker, Cream-colored Woodpecker, the recently described Kawall's Parrot, Red-fan Parrot, and Pompadour Cotinga. Also possible are sightings of the locally rare Black-necked Aracari in early mornings especially. Sometimes a mixed flock passes through near the towers, giving canopy views of species such as Bar-breasted Piculet, Yellow-throated Woodpecker, Tooth-billed Wren, Red-billed Pied Tanager, and Yellow-shouldered Grosbeak. As the day heats up thermals bring out soaring raptors such as Gray-headed Kite, Double-toothed Kite, White-browed Hawk, and perhaps rarer species such as Crested Eagle and Harpy Eagle, best viewed from the towers. Morning boat transfer back to Alta Floresta with some birding en route. Early afternoon flight to Cuiaba followed by land transfer to the start of the Pantanal Highway, referred to locally as the Transpantaneira. Night at Pousada Piuval. Full day birding this section of the Pantanal. The rivers. wetlands, flooded pastures, gallery forest, and open scrub are home to astonishing numbers of birds. On everyone's list of most wanted birds is the beautiful blue Hyacinth Macaw, seen in this area every day. The open cerrado is home to Greater Rhea and Red-legged Seriema. Other possibilities include Southern Screamer, Maguari Stork, Jabiru, Planalto Slaty-Antshrike, Large-billed Antwren, Mato Grosso Antbird, Rufous Cacholote, White-lored Spinetail, the stunning Helmeted Manakin, and Red-crested Cardinal. At sunset Nacunda Nighthawks commonly appear. Night at Pousada Piuval. Morning birding an area near the lodge looking for Long-tailed Ground-Dove, Yellow-collared Macaw, Chotoy Spinetail, Suiriri Flycatcher, Rusty-collared Seedeater, and Scarlet-headed Blackbird. After lunch, drive farther into the Pantanal, birding en route. After arrival at the lodge along the Pixaim River, Afternoon boat trip along the Pixaim River where possibilities include Blue-throated Piping-Guan, Boat-billed Heron, Black-collared Hawk, Sungrebe, and the rare Agami Heron. Dusk brings out Nacunda Nighthawks and the more numerous Band-tailed Nighthawks. Night at SouthWild Jungle Lodge. Early morning will be spent birding dry forest near the lodge. The birding is easy along flat trails through open woodland. Possibilities include Tataupa Tinamou, White-wedged Piculet, Golden-green Woodpecker, Pale-crested Woodpecker, Band-tailed Antbird, Red-billed Scythebill, Narrow-billed Woodcreeper, Fuscous Flycatcher, Rufous Casiornis, Ashy-headed Greenlet, Purplish Jay, and Masked Gnatcatcher. 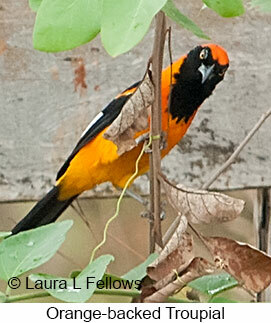 Open brushland around the lodge offers additional species such as Variable Oriole, Pileated Finch, and Orange-backed Troupial. Feeders around the lodge attract Chestnut-eared Aracari, Yellow-billed Cardinal, Silver-beaked Tanager, Grayish Saltator, and Grayish Baywing. After lunch another boat trip along the Pixaim River. Night at SouthWild Jungle Lodge. After breakfast drive south along the Transpantaneira with birding stops en route. Large numbers of caimans densely congregate around permanent pools as temporary ponds in the Pantanal dry up. Numerous water birds including herons, egrets, Jabirus, Wood Storks, four species of ibis, and five species of kingfishers along with raptors, parrots, and macaws are everywhere. Arrive at Porto Jofre, marking the end of the Transpantaneira, by lunch. Porto Jofre is a fishing town on the Cuiaba River, where we'll spend the next two nights. That afternoon we'll be cruising the river by motorboat looking for our main target species, the Jaguar. Numerous boats are on the river searching for jaguars and are all in radio contact. When a Jaguar is spotted, everyone is alerted and descend upon the spot in hopes this magnificent mammal will still be there. Chances of seeing one or more of these magnficient animals during our stay are very high. Night at Pousada Porto Jofre. All day on the river searching for Jaguars. A decade ago Jaguars were wary and difficult to see. Now, with establishment of a state park and protective measures in place, Jaguars are less wary and seen almost daily along the river. During our forays birds along the river won't be ignored. Pied Lapwing, Yellow-billed Tern, and Large-billed Tern are common as are cormorants, Anhingas, and various kingfishers. 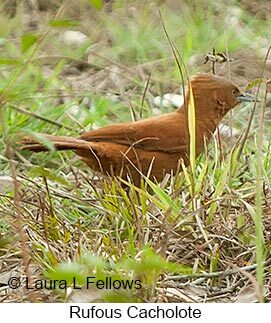 Occasionally, Bare-faced Curassows and Gray-necked Wood-Rails appear along the riverbanks. Raptors such as Black-collared Hawk, Crane Hawk, Savanna Hawk, Great Black Hawk, and Roadside Hawk are also quite common. Mammals other than Jaguars are also present. Capybaras are very common, Giant Otters are commnon, Brazilian Tapirs, though rare, are possible, and three species of monkeys are regularly seen. Night at Pousada Porto Jofre. Morning will be spent back on the river if Jaguars have not yet been seen. Otherwise. leave after breakfast for the drive back up the Transpantaneira to the Rio Claro. After arrival at the lodge, the rest of the day will be spent birding around the lodge. Some night birding nearby may produce Scissor-tailed Nightjar and perhaps mammals such as Crab-eating Fox. Night at Rio Claro Lodge. Morning will be spent birding the lodge grounds. 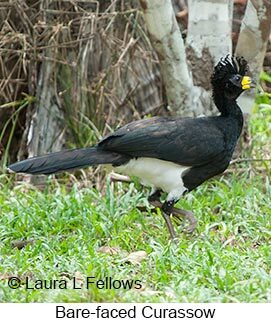 Chestnut-bellied Guan and Razor-billed Curassow often appear during early morning. Several species of parrots including the scarce Black-hooded Parrot are usually also present. Birding the wooded entrance road may produce Undulated Tinamou, Pale-crested Woodpecker, Rufous-fronted Thornbird, and Planalto Woodcreeper. After early lunch, transfer to Cuiaba for late afternoon flight back to Sao Paulo. Tour ends at the airport in Cuiaba. Most international flights from Sao Paulo depart late at night. If desired, we can arrange for an overnight stay in Sao Paulo if your international flight is next morning. Overnight flights arrive in US. Price does not include internal flights.